One of the original 13 colonies, Maryland is represented by a star and a stripe on the 13 star U.S. flags. The arms on which the Maryland state flag is based are those of the state. They were earlier the arms of the Calvert Lords Baltimore, who were the Lords Proprietor of Maryland before the Revolution. The Calverts used them as arms of dominion (e.g., changing the supporters that had been granted by the College of Arms and adding an earl's coronet in place of a baron's in token of their designation as "counts palatine" under their charter), and they were essentially taken over by the new government on that basis. There was at least one other flag used by the state of Maryland. 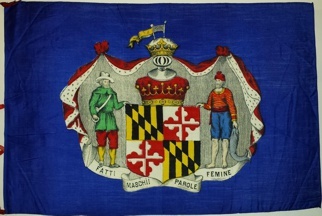 The current flag was first used by the Maryland Fifth Regt. in 1888 during a parade in Baltimore. It included the coat of arms of the first Lord Baltimore's father's family, the Calvert black and gold as well as that of his mother's family, the Crosslands. This coat of arms was based on a pun. The family's name was croffland. Written in the runic alphabet, the name meant farmland, as those who are familiar with crofters might guess. Transliterated into the Latin alphabet, the flowing f's became esses. It was natural to use a cross for the coat of arms. During the War for Southern Independence (American Civil War), Maryland was occupied by northern troops and civil rights were suspended. Many people escaped across the Potomac river into Virginia and fought in the Army of Northern Virginia under Robt. E. Lee, the confederate general. Some of them served in Virginia regts, but many served in Maryland units. They used the cross botonee of the Crosslands as a breast decoration. Any Marylander who was caught wearing red and white colors or dressing their baby in red and white was arrested for treason. After the war, the Maryland fifth contained many who had fought on opposing sides during the War. They adopted the flag, which became the state flag in 1904. References to the use of a state flag from 1776-1904 do not specify what flag was used. As I understood it, this flag was identical to the current state flag, with the exception that the quarters were reversed -- Confederate veterans placed the Crossland arms in the 1st and 4th quarters, hoist to the left, with Calvert in 2nd and 3rd. The Maryland Legislature flipped them to their present positions in 1904. I found an illustration of the 1648 seal of the colony of Maryland which clearly shows the Calvert quartered with Crossland arms on one side, and at www.free-researchpapers.com/dbs/a13/hmd137.shtml which says "The Crossland family was that of George Calvert's mother. Since she had no brother and that made her the heiress of her family estate, she was allowed under heraldic law to quarter her arms with those of her husband" That last address one of the main questions I had not been able to get a clear answer to before. If she was truly an heiress then it would indeed have been customary to quarter the arms of the two families. This is my 11 by 17 inch printed silk flag made prior to Maryland's adoption of the current state flag in 1904. I don't know of any official action that Maryland took regarding a state flag prior to that date so this is most likely a manufacturer's idea of what a Maryland state flag should have looked like. (a) The State flag is quartered. (b) The 1st and 4th quarters are paly of 6 pieces, or and sable, a bend dexter counterchanged. diagonal band on which the colors are reversed. and white on the red, and all being as represented upon the escutcheon of the State seal. Section 13-203. Only a gold cross bottony may be used as an ornament on the top of a flagstaff that carries the State flag. Maryland Day is the one day each year set aside to remember our State's long and interesting history. The celebration of Maryland Day began in Maryland's schools in 1903. That year, teachers from around the State agreed that a special day needed to be set aside for school programs that would help students appreciate our State and its history. They chose March 25 as the day to call Maryland Day. It was on that day in 1634 that Maryland's first colonists left their ships, the _Ark_ and the _Dove_, and came ashore at St. Clement's Island to give thanks for a safe passage across the Atlantic Ocean. In the early years, Maryland Day programs in Maryland schools usually began with the students singing several songs about Maryland and America. Then the principal or an important person in the community would talk about the early history of Maryland and some of the things that made Maryland so special. Often one or more students would read essays or poems they had written in honor of Maryland Day. School buildings were decorated with the Maryland Colors of black and gold. Students often pinned black and gold ribbons on their clothing. Red and white are the other two colors of Maryland - the University of Maryland's sports teams usually dress in red and white, for example - but back at the turn of the century, only 35 years removed from the Civil War/War Between the States/War of Northern Aggression, this *might* have still carried a connotation of Confederate sympathies, as these were the colors worn by Maryland Confederates. These days, that meaning is no longer generally recognized. Maryland Day became so popular in the schools that the Maryland General Assembly in 1916 made it an official State holiday. Note that Maryland Day remembrance in schools is no longer quite the event it was, and its observance waned even while I was in school. I can remember one history teacher who made it a big deal; he was born near Assateague Island (the setting of the popular children's book Misty of Chincoteague, and home to the largest mosquitoes I've ever seen in my life :-) He'd remind us of the day beforehand, and would come in on Maryland Day dressed in colonial garb to teach a lesson on early Maryland history. By the time I reached high school, there would possibly be a mention in the school announcements that day, but that was it. Fortunately, the pre-school that my older daughter Abby attends flew their Maryland flag all week in celebration of Maryland Day, and a short lesson on Maryland was taught (as much as could be taught to a group of four- and five-year-olds). This is simply the Rainbow Flag with the Maryland State Flag in the canton, which I saw again in nylon, in 2x3' and 3x5' (91 cm x 155 cm). A rather busy flag, but at least nominally heraldically correct. The state military crest, which is the crest used in the coats of arms of units of the National Guard, as granted by the precursor organizations of what is now the Army Institute of Heraldry. The official Institute of Heraldry blazon is "A cross bottony per cross quarterly gules and argent."